Coordonnateurs : Kinghorn A. D., Falk H., Kobayashi J. 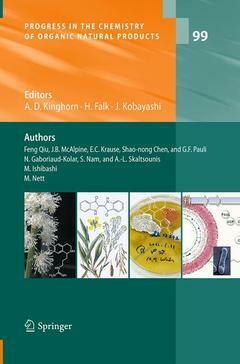 The volumes contain contributions on various topics related to the origin, distribution, chemistry, synthesis, biochemistry, function or use of various classes of naturally occurring substances ranging from small molecules to biopolymers. Each contribution is written by a recognized authority in the field and provides a comprehensive and up-to-date review of the topic in question. Addressed to biologists, technologists, and chemists alike, the series can be used by the expert as a source of information and literature citations and by the non-expert as a means of orientation in a rapidly developing discipline. Pharmacognosy of Black Cohosh: the phytochemical and biological profile of a major botanical dietary supplement. - The evolution of Indigoids: a colorful history. - Bioactive heterocyclic natural products from actinomycetes having effects on cancer-related signaling pathways. - Genome mining: concept and strategies for natural product discovery.